Designed specifically for graphic arts and framing use. 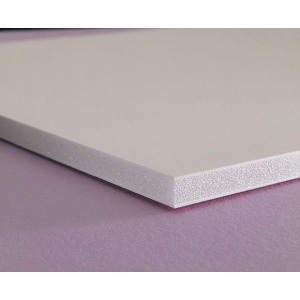 * These foam boards feature resilient polystyrene cores that ensure a clean precise cut with a mat cutter or utility knife. * Uniform edge every time. * Lightweight but rigid resists warping denting crushing and won’t ripple. * The smooth white clay surfaces are ideal for mounting framing silk screening and more. * Dry-mount vacuum mount (recommended range: 180° to 220°F) use spray adhesives or laminate. * Bonds easily with fabrics paper and many other materials.